Sticky Honey Garlic Butter Shrimp are coated in the most amazing sticky honey garlic butter soy sauce. This is a quick 20 minute meal that you will make again and again! It is freezing right now here in Utah. We are getting such low temperatures and all we want to do is stay inside and be bundled up! I hate when Christmas is over and we take all of the decorations down. We are just left with the cold. Sickness has been going around our house as well. We are all counting down the days until our Hawaii trip next month! Since the New Year has started I made a goal to make dinner at home more. The holidays were crazy and it is so nice to settle down a bit. I love cooking at home and eating together at night is just so much better. 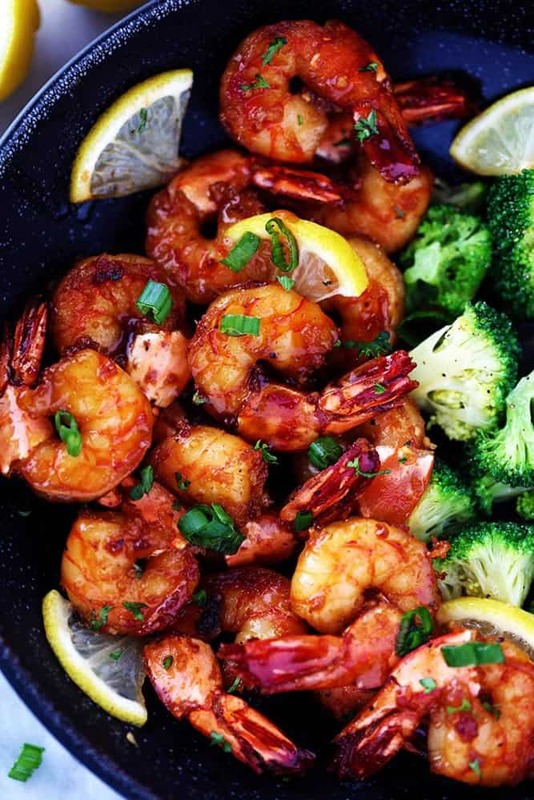 We started our week off with this amazing Honey Garlic Butter Shrimp. I am not even the biggest fan of shrimp… the hubby is… and this is one of the best meals that I have ever had!! But my favorite part is that this meal was ready in under 3o minutes. You can have amazing meals for your family at night that require little effort but are restaurant quality. You are going to love the sticky sauce on this shrimp and this will be a meal that you want to make again and again! In a small bowl whisk honey, soy sauce, garlic and lemon. Add half of the sauce to the shrimp and let marinate for 30 minutes. In a medium sized skillet add the butter. Add the shrimp and discard marinade. Season with salt and pepper. Turn the heat to medium high. Cook until the shrimp turns pink about 2 minutes each side. Add the reserved marinade and pour over shrimp. Cook until the sauce starts to thicken and coats the shrimp. Garnish with green onions. I think this will also be great with scallops. Can’t wait to try it. This is SOOOOOOO good! My husband loves it! I even made it with chicken and it too was very good. Thanks for the recipe. This is one outstanding dish . I did add sesame seeds and a little red pepper flakes for spice. Looking forward to baked chicken wings in this same sauce. I made this recipe tonight and the guys loved it! They even made suggestions about using this sauce on other meats or vegetables. That never happens! Will definitely make this again. 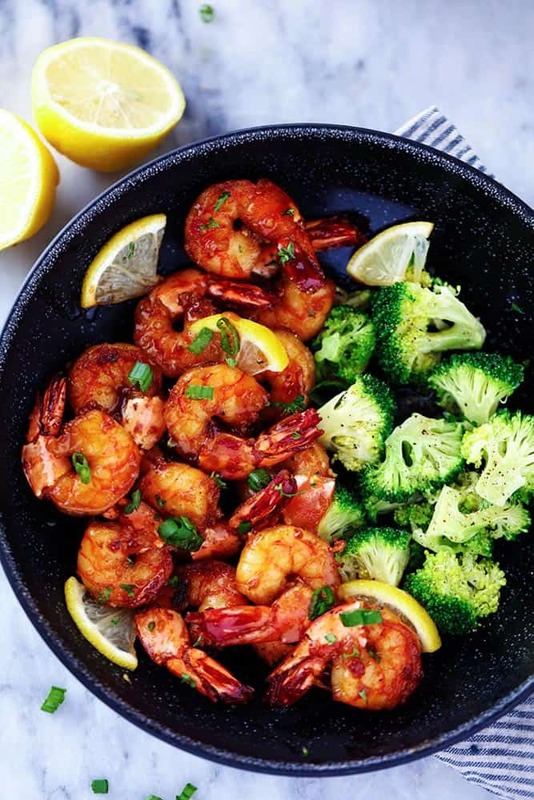 Absolutely delicious honey garlic shrimp. Easy to fix. Quick and delicious! Thanks for the recipe. This looks and sounds like a yummy dish! I would love to try making this sometime. Made this tonight w/lyour lemon garlic tilapia dish my kids which are the hardest to please loved it. Knew I would but WOW not this much. I didn’t feel like going to the store & wanted to try something new&luckily already had every ingredient in my cabinet. Thesticky hi ey garlic butter sauce is very good and I like the addition of the green onions. Next time I would remove the shrimp after they turn pink and cook the sauce down til it thickens, then add shrimp back in to coat. My shrimp were overcooked following the original directions. Thesticky honey garlic butter sauce is very good and I like the addition of the green onions. Next time I would remove the shrimp after they turn pink and cook the sauce down til it thickens, then add shrimp back in to coat. My shrimp were overcooked following the original directions. Crazy good! I added asparagus saluted for 2 minutes in butter before adding shrimp and a tbs. Sambal since I like spice. Just terrific! Just want to point out that in step one you say to discard the marinade, but in step two one reintroduces it to the pan. Those who rush and don’t read through a recipe (not me, will be trying this tonight), may be upset when they realize they need the marinade they just discarded. Would change to “set aside” or “reserve” for clarity. Looks like a great recipe otherwise, very much looking forward to giving it a whirl! Going to be adding some Chile paste and a touch of housing while reducing the honey and maybe subbing some molasses (we buy expensive honey and I’m too cheap to use a half cup’s worth). It says marinate I half the sauce and that is what you discard. You use the remaining half in the skillet. Sean, Glad you caught that. Thank you for the heads up. I always read the comments, glad I did. Just want to point out, if you can’t comprehend what you read, you shouldn’t stick your two cents in. It clearly says to marinate shrimp in half the sauce. You will be adding the other half later. There’s no need to be rude to anyone Gina. No-one requires you to point anything out to them. It’s a recipe. Easy mistake. You are suppose to marinade your shrimp in half of the marinade, and discard that portion, then use the other half of the marinade as the sauce at the end. At a quick first glance over the recipe I also thought that too. It is a very simple mistake anyone could’ve made if not comprehending the recipe while reading. I agree it could be fixed with a quick switch of wording. I wanted the receipt for the coconut cake, but I missed it, the one with the coconut milk & cream cheese frosting. Can I please get it. I made this recipe tonight. Had broccoli for a side dish. I must say it was very good. The flavor was a lil spicy and sweet. I will be making it again. Thanks for the recipe..
Oh I love this recipe! It looks so good, my wife and I would both love this haha thank you! 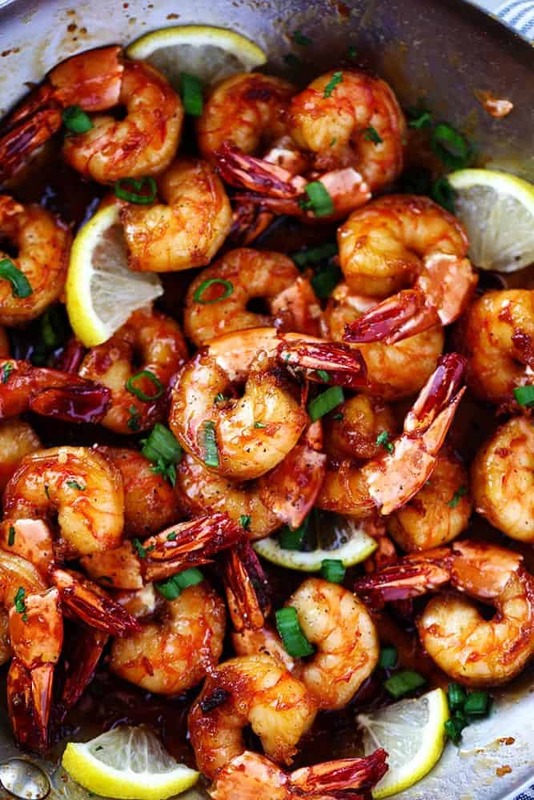 Sticky honey garlic butter shrimp is way overcooked, following your instructions. 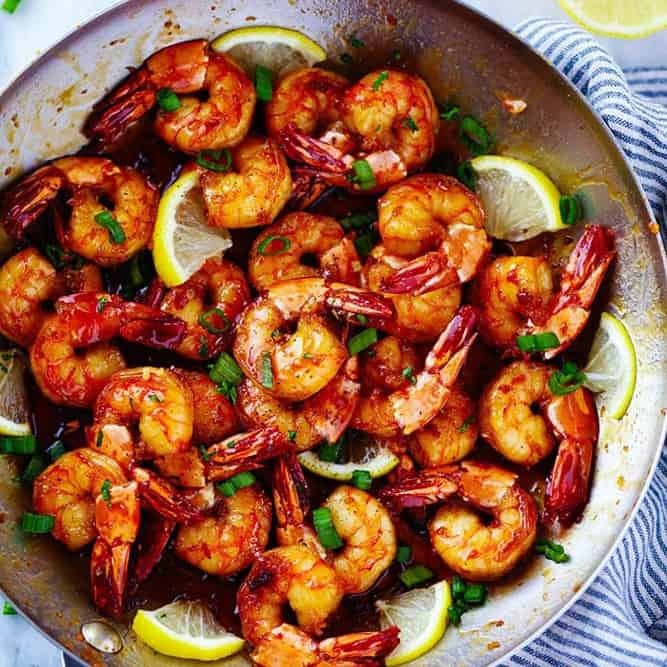 Removing thc shrimp from the pan while the sauce starts to thicken then returning them to to be coated mostly alleviates the rubbery shrimp problem. Made this for dinner. I have 4 kids, ages 12-7 and they loved this and requested more of it!! Made this tonight and it is so delicious! What’s a good side? Pasta / rice ? Yes! Both of those work great or mashed potatoes or any veggie. Wondering if I can use frozen pre-cooked shrimp? Would like to try tonight. Why do I get a blank page when I hit the print button? I have tried it a few times now and it seems to be working fine on my end. Maybe try it again and if it is still an issue, it may be a player issue with your computer or printer. I am sorry for the trouble. Thanks for following along! I have made this 3 times. The flavor is great. It never thickens or gets sticky. What am I doing wrong? It may take a few extra minutes for it to thicken and get sticky. I also made this, following the recipe exactly and the sauce never thickened or got sticky. 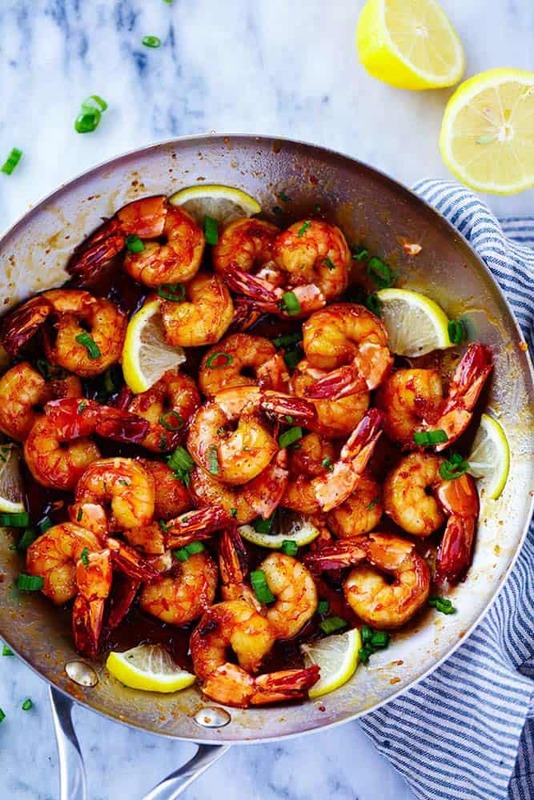 Do you have any tips for this because if you leave the shrimp in too long they will be over cooked. I have made this several times. I can never get the sauce to thicken let alone even be sticky. The flavor is good I just wish i could get it sticky. I Agree! The sauce did not thicken. I added extra honey but still did not thicken. I drained the marinade from the shrimp so it wouldn’t add extra liquid but that did not make a difference. Maybe some cornstarch would help thicken. Great flavor. I also use honey and teriyaki as a marinade for bbq salmon. Add cornstarch. Just a little. Thinking of using this marinade for chicken. Wanted to see if u think there would be an issue leaving the chicken in with the marinade for several hours as opposed to the 1/2 hour you mentioned in ur instructions for the shrimp. Has anyone tried this with garlic powder? I am out of garlic and scraping by until payday.?? 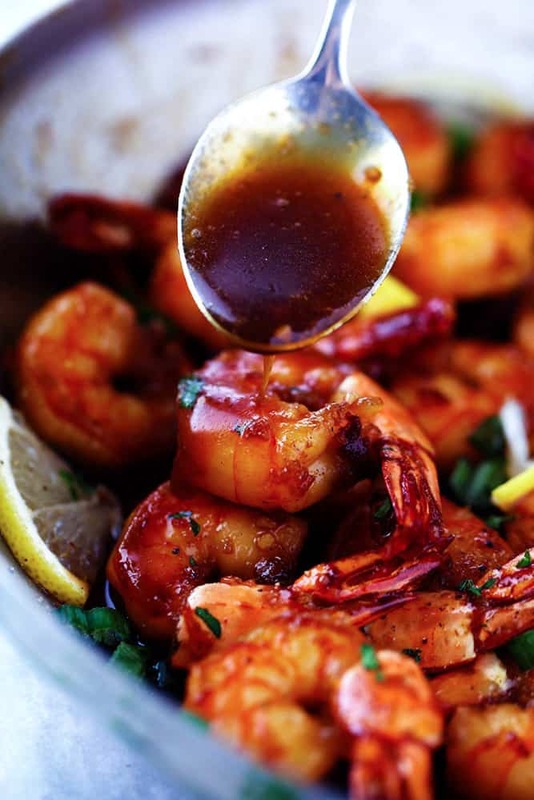 Did you drain the shrimp after cooking before adding the reserved marinade? There was a good deal of liquid in my pan, and it made the sauce runny. When I see your video it seems as if you’ve drained them. Yes, I did drain some of the access marinade in the sink before adding them to the pan. You can also leave the marinade on and not drain it but cooking the shrimp a little longer. Hope that helps explain it better. Can someone tell me what size shrimp you use, also do you use fresh or frozen? You will want to use 1 pound large shrimp that is peeled and deveined. They will be either fresh or frozen. Just for the frozen you will want to thaw before cooking. Hope that helps! Why can’t u just thicken the sauce first then add the shrimp? You are welcome to try it that way too! Hope that helps you! Enjoy your shrimp! This dish is so easy to make, we love it! I serve it over angel hair pasta. There is one misleading statement, it says to disguard liquid shrimp is marinated in. Do not disgurd, use it in the end with left over sauce. This recipe is 5 star! Tried this last night my sauce was a bit sticky. However I let simmer and cooked probably more then what needed. I mixed in some Lingine noodles after it was cooked! It was a hit in my Barracks! All the soldiers loved it! Thanks again!